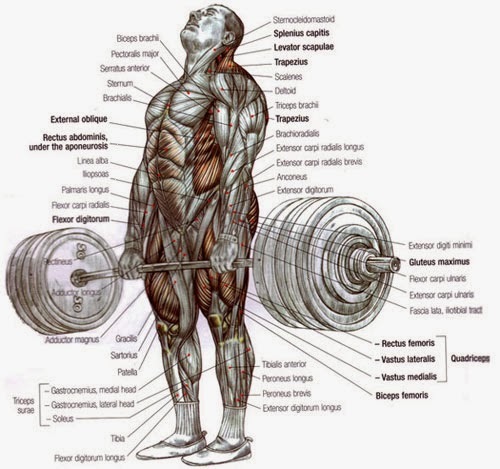 Listed below is a table of the muscles that are involved in the conventional deadlift. They are ranked on a scale of 1-5, with 5 being the most involved and a 1 being the barely involved at all. It should be logical to have a strong conventional deadlift you must make the muscles that are going to move that weight stronger. Note: It is possible that individual variation, biomechanics, and form might make a muscle work either a little bit more or a little bit less involved based on how the lift is perform. If you believe that increasing the size of your muscles will help improve the deadlift, then focus on training the muscles that received a 3 or more on the above scale. Give it 3, 6, even 12 months of hard training. Track your progress and try to establish your own personal correlation between your muscle size and your performance on the platform. It is worth noting that because the deadlift requires force to cross the most stable major joint in powerlifting (the spine/hip) adding size doesn’t tend to have the same impact to the lift as it might other lifts (particularly the bench). This is why this lift is the typically the least affected by any change in bodyweight. However bigger and stronger engines (traps, glutes, erectors, hamstrings, forearms) that help move and control the conventional deadlift can still significantly improve performance. Is this muscle recruitment for a deadlift bar or a power bar? Also, what is this data based on? The Deadlift is to strength gains. As reading is to knowledge. Good article. Great subject. I really like the table of muscle involvement ratings, it’s a great idea. I have actually linked to your post as an extra resource on my deadlift guide article, I hope you don’t mind me doing so. I wanted to get in contact with you today to see if you’d be interested in a little collaboration. Since both of our blog posts are related I thought I’d reach out to see if you were interested in linking to each other’s blog post. If you’re interested in this quick and simple collaboration just let me know. Awesome layout on the article, really like the table on the muscles. I will make sure to send some people your way when they ask me about deadlifts! I would like to propose the link exchange deal with your website allaboutpowerlifting.com, for mutual benefit in getting more traffic and improve search engine’s ranking, absolutely no money involve. We will link to you from our Fashion and Personal blogging authority site – https://www.souledamerican.com/, from its homepage’s sidebar. In return you will agree to do the same to link back to one of our Music & Entertainment Site, from your allaboutpowerlifting.com’s homepage too (sidebar, footer, or anywhere on your homepage), with our brand name Harajuku Fever. We will link to you from our Fashion and Women authority site – https://www.souledamerican.com/, from its homepage’s sidebar. In return you will agree to do the same to link back to one of our client site, from your allaboutpowerlifting.com’s homepage too (sidebar, footer, or anywhere on your homepage), with our brand name Harajuku Fever.